Six months ago, a deadly combination of earthquake and tsunami rocked Sulawesi, Indonesia. The double disaster claimed more than 2,000 lives and affected more than 2 million people. This tragedy was the deadliest earthquake to strike Indonesia since 2006. Villages were reduced to rubble; countless livelihoods were destroyed; vital crops were decimated; and thousands of families were forced from their homes. Aina, Azim and Tombeng are three of these people. When the 7.5 magnitude earthquake struck central Sulawesi, it turned their whole world upside down. Like so many people across the area, they lost their home and livelihood in the disaster. Thanks to your generous donation, Oxfam and local partners mobilized a swift emergency response for survivors in Sulawesi and distributed vital aid to people in dire need. We provided essential supplies like ready-to-eat food, water treatment equipment and purification kits and emergency shelters. We built sanitary infrastructures and helped the communities to rebuild their water distribution systems. We also engaged people in paid labor to remove rubbles, rebuild roads and community spaces. The earthquake brought the region’s economy and countless families’ lives to an immediate standstill a few months ago. But now, several months later, people are picking up the pieces. Families now have access to clean, safe drinking water; mothers have hygiene kits to keep their families safe from disease; and communities now have temporary shelters with access to toilets. With Oxfam’s support, they are overcoming their shock and dealing more each day with the devastation. But their needs remain plenty. We are shifting to longer term support to help people restart their livelihoods. We aim to reach 500,000 people in the year ahead. Given this unique geography, Indonesia is highly vulnerable to extreme weather events and climate shocks. 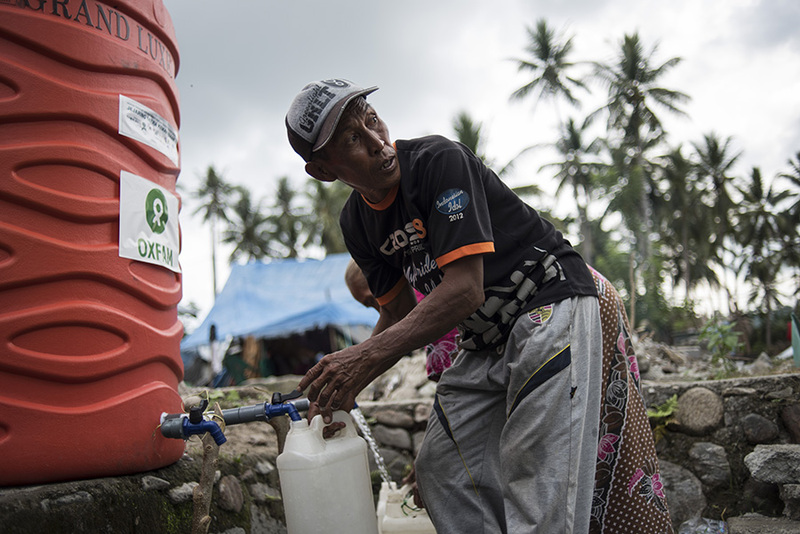 We work with local partners to improve disaster management systems and develop sustainable ways for people to earn a living, despite the ever-looming threat of shocks and hazards.